The other day, I started thinking about how crazy of a journey this past couple of years has been. Two years ago to this day, I had never made a quilt (outside of the one tie quilt I made heavily assisted when I was eight years old.) My mom is a quilter and has been trying to get me to join her in this quilting world for so long, but I resisted for quite awhile. Why did I resist so much? Well, one of the main reasons was this: I didn’t know how to even get started. I remember thinking to myself, “what do you even need to start quilting?” After doing a few searches on the Inter-webs, I remember being quickly overwhelmed. There is SO MUCH information and I just had no idea what to do with it all. 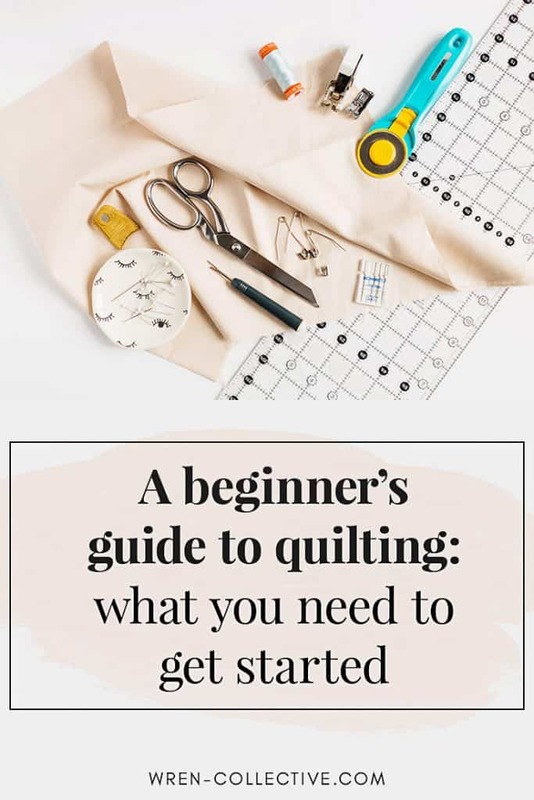 If you’re like I was a couple of years ago and want to start quilting but don’t want to spend your life’s savings on every quilting gadget out there, then look no further. I’ve put all of the things you need to make your first quilt here in one spot. I know, guys. This one is a total shocker. You’re going to need a sewing machine. But guess what? You don’t need anything top-of-the-line, especially if you’re just starting out. I don’t even sew on anything crazy expensive. I did end up upgrading machines about a year after I started quilting, but I started on a very basic machine from a big-box store that was gifted to me in college. Hello, Project Runway edition Brother machine! 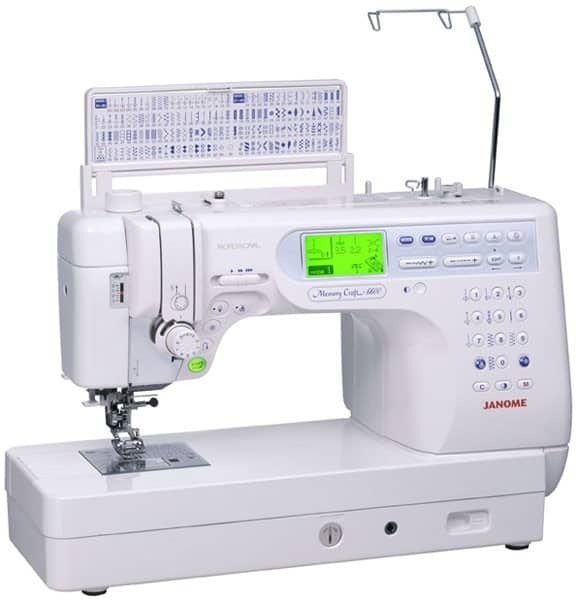 Once I realized that I was DEEP into this quilting world and was going to continue making quilts like a mad woman, I knew I needed to upgrade machines. I ended up getting this Janome for a few reasons: it had a nice throat space for quilting since I quilt most of my quilts myself on my domestic machine, it is a work horse (fast, solid, efficient), it sews smoothly, it has a great zig-zag stitch (I zig-zag stitch quilt my quilts a lot), and it was in my price range. A close second was this Juki. I know lots of modern quilters who adore this machine, and honestly I might end up grabbing one one of these days to have as a second machine. Basically, all this to say: you don’t need anything with all the bells and whistles to make a quilt, especially if you’re just starting out. You can always upgrade later! I’m obviously starting this post with all of the glaringly obvious things, but here we go: along with the sewing machine, you’re going to need fabric and batting. Fabric to make the quilt top, back, and binding and batting to go between the top and back. A quilt sandwich, if you will. Let’s start with fabric. Most quilters quilt with 100% quilter’s cotton fabric. Generally speaking, quilter’s cotton is a medium weight, sturdy cotton fabric which is perfect for quilting. Local quilt shops are the perfect place to find quality fabric for quilts, as are online quilt shops. Cottoneer and Fabric Bubb are among my favorite online shops. One thing I would caution is to stay away from big box store fabrics. Overall, they tend to be of a poorer quality. Sometimes you can find decent fabrics there, but you have to be very careful. Above is an example of fabrics I quilt with. These are all 100% quilter’s weight cotton with the exception of the far left. That is a metallic Essex linen, which is 55% linen and 45% cotton. I quilt with Essex a fair amount and love it. Batting is a very personal choice. 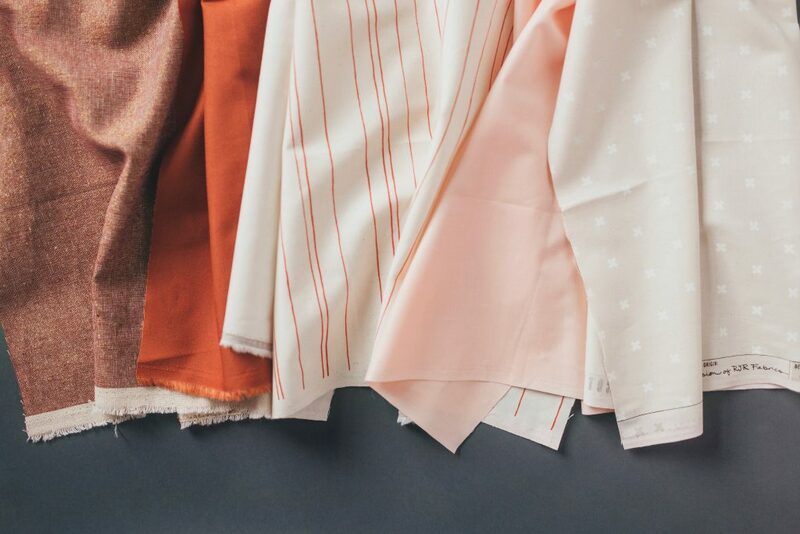 When starting out, trying 100% cotton batting is a great place to start. To this day, 100% cotton batting is what I use most of the time. It provides the best soft “quilt crinkle” texture after washing your quilt which I absolutely adore. This Quilter’s Dream cotton batting is what I use the most, but I also use Warm and Natural often. I have several friends who also like to use a polyester/cotton blend batting. It has a higher loft, which makes your quilt appear fluffier. It also has minimal shrinkage if you don’t want the super crinkly quilt look after washing your quilt. You’re going to need a cutting tool in order to cut your fabric into the pieces you need to sew together (my husband just scratches his head that I buy fabric, cut it into small pieces, and then sew them back together again, ha.) A 45mm rotary cutter is the perfect size for most general cutting. This is hands down my favorite. I’ve owned several, but I always come back to this one. It just feels so good in my hands! Also, while we’re on the subject of rotary cutters: I’ve learned that blades really do matter. I wasn’t sure about these endurance blades, but I can honestly say they last much longer than normal blades. You’ll need a self healing cutting mat to use as a cutting surface. The mat pictured above is the very same one I bought when I first started quilting two years ago. It is starting to show some wear in some spots, but it is double-sided so it’s still got quite a bit of life left. I would recommend getting the largest one you have the space for. 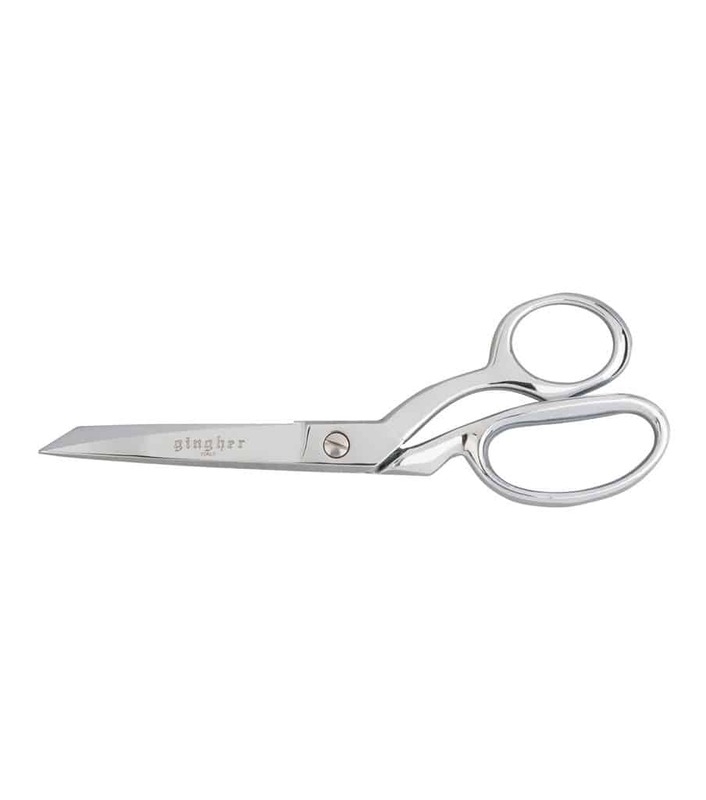 Good quality shears that are used for fabric only (my husband knows he’s in major trouble if he uses my fabric scissors to open cardboard boxes) are important. These are my favorite. They glide through fabric like butter! Rulers are a slippery slope; there seems to be a ruler for every little thing in the quilting world. Every size and shape you can imagine–it can be a bit intimidating! I’ll admit, I’ve added several rulers to my arsenal over the last couple of years, and most I really do use and love. However, when first starting out, all you really need are a couple of quality rulers. A long ruler is a must-have to make your initial cuts off of larger pieces of fabric. This 6.5″ x 24.5″ ruler is definitely my favorite (it has little “grips” on the underside to help keep the ruler in place as you’re cutting–it’s amazing!) I also use this when I square up my quilts after they’ve been quilted and when I mark lines on my quilts during the quilting process. I use it all the time! The second ruler I bought when I was first staring out is this 8.5″ square ruler. It’s also the same brand as my long ruler so it also has the little “grips” on the bottom. I have found that it’s a great size for making smaller sub-cuts. 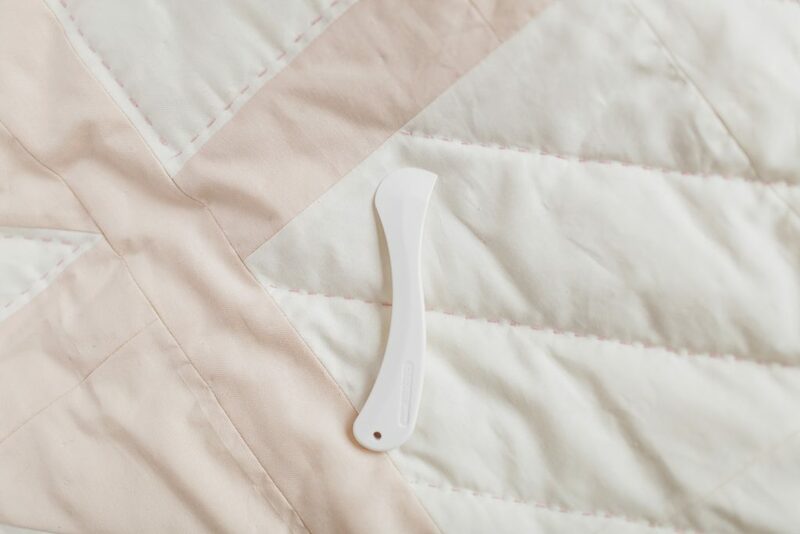 I piece my quilts with 80/12 universal sewing machine needles and have great luck with them. The most important thing I’ve learned is to change your needle frequently. I change my needle with every new project. Also, if I notice anything wonky with my thread/tension, the first thing I do is change my needle and that solves the problem most times. 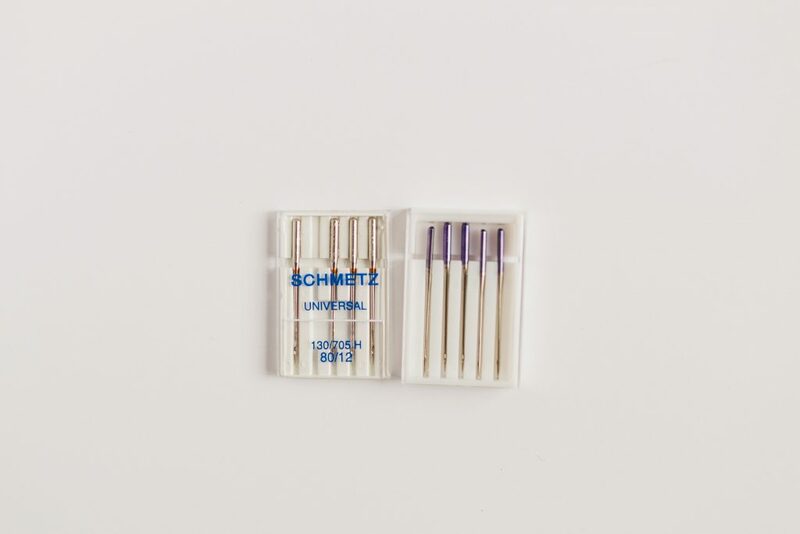 On my Janome, I have the best luck quilting with these purple tipped needles. When I use my Brother, I quilt with the 80/12 needles mentioned above. For thread, I piece and quilt primarily with 50 weight cotton thread. 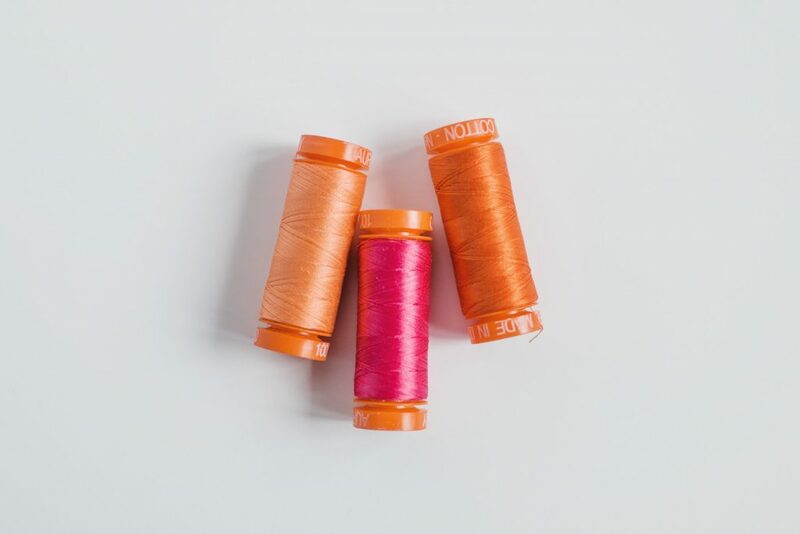 Gutermann, Aurifil, and Connecting Threads are my favorite brands. The photo below shows bright colors, but I generally piece with a neutral color. Off white and light-med gray are my favorite colors to piece with. I love buying these large cones of thread because with 5,000 yards of thread per cone, they last for such a long time and are a great price. Unfortunately, the seam ripper is often my most used tool. It is just an inevitable point of the process: mistakes happen. So you’re DEFINITELY going to need one (or seventeen, ha) of these bad boys. This is similar to the one I use most often. Fun fact about the quilt pictured above: I ended up ripping out all of the initial quilting I did on this because I didn’t love how it looked. Though it was a pain in the you-know-what, it was worth it in the end. I love the texture of this zig-zag quilting! When piecing your quilt top, you’ll use a 1/4″ seam allowance. 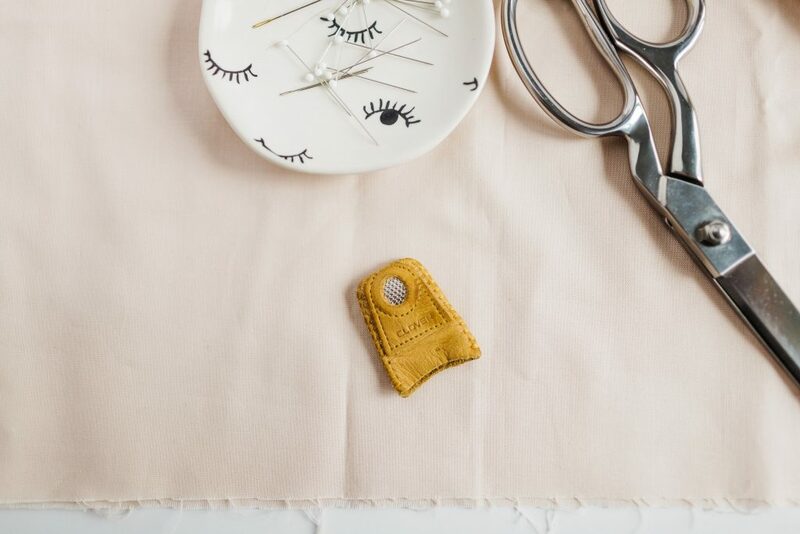 A lot of sewing machines come with a 1/4″ foot that has a guide to follow as you sew, but if your machine doesn’t, you can measure 1/4″ from your needle and put a line of washi tape down to use as a guide. A walking foot is crucial for the quilting process (once you’ve pieced your top and are stitching through your “quilt sandwich” (top, batting, and backing.) Because you’re moving multiple thick layers through your machine when you quilt, you need a special foot called a walking foot. When you have a walking foot attached, it allows the fabric to be fed through from the top and bottom. This makes it much easier to maneuver and you’ll end up with a nicer end result. Walking feet are specific to most machines, so do some research and buy a walking foot that will fit your specific machine. 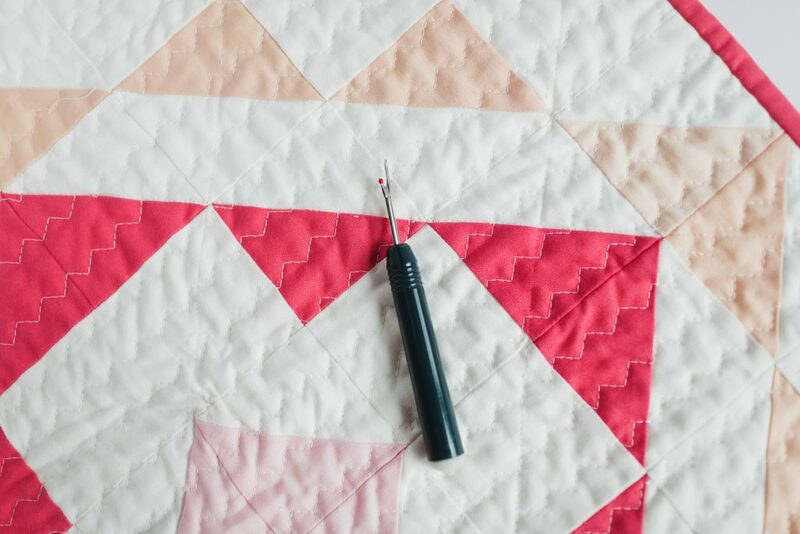 When piecing your quilt, pins come in very handy in order to hold your pieces in place, resulting in more accurate piecing. Not all pins are created equal. These and these are my favorites and what I use most often–they are sharp and thin. When you’ve pieced your quilt top and backing and are ready to make your “quilt sandwich” (top + batting + backing), you’ll need to hold these layers together somehow until you get it quilted. A lot of people like to use basting spray, which essentially is a spray that “glues” your layers together. I have tried basting spray several times, but I don’t like it. That is a different post for a different day, but it just doesn’t work for me. 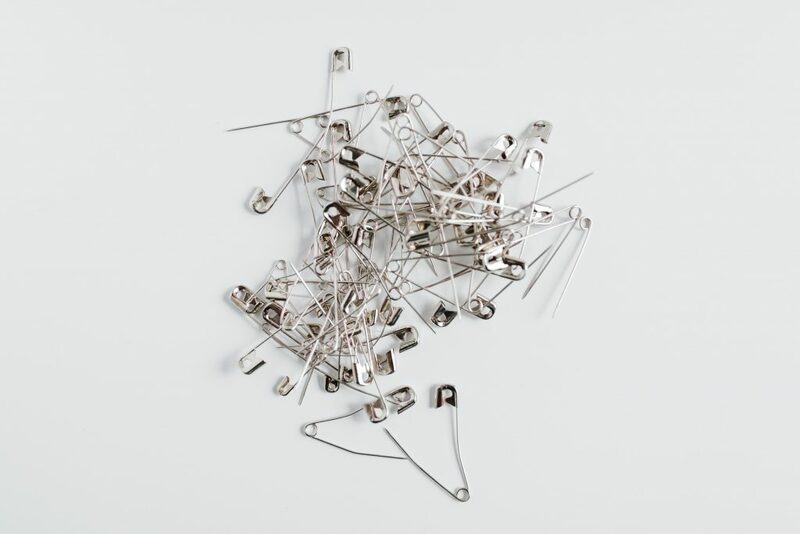 I use basting pins, or curved safety pins, to hold my three layers together. These are similar to what I use. These wonder clips are all I use to hold my binding down in place as I hand stitch it down. 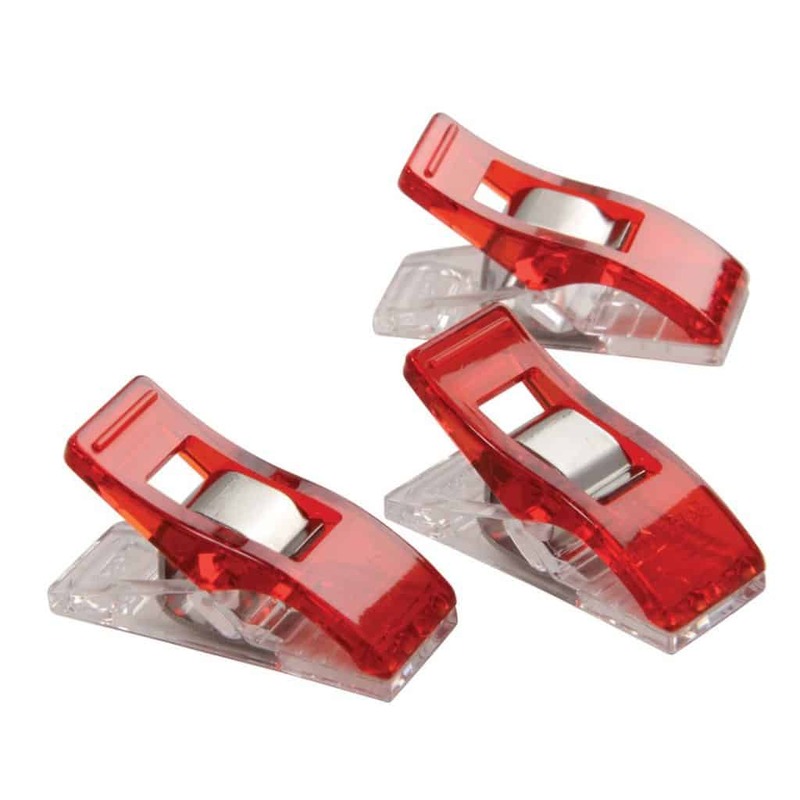 I also use these on the rare occasion when I machine sew my binding. I also use these when I English paper piece; they come in very handy! Marking utensils come into play in a couple of situations: first, you’ll be marking lines on fabric quite often. These lines are either lines you sew directly on or that you’ll sew 1/4″ away from. Either way, I use this water soluble pen quite often when marking a line. The blue end is soluble in water and the purple end actually dissipates when exposed to air for several hours. Pretty nifty! My all time favorite marking utensil is this hera marker. 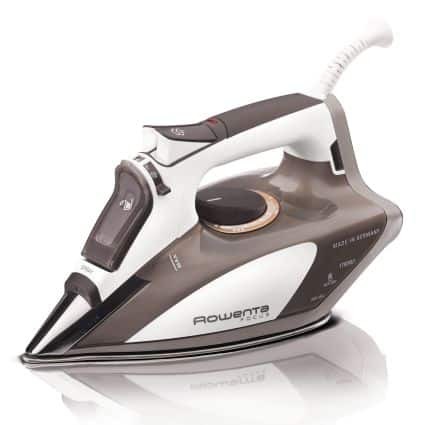 It leaves a crease on your fabric that disappears over time. 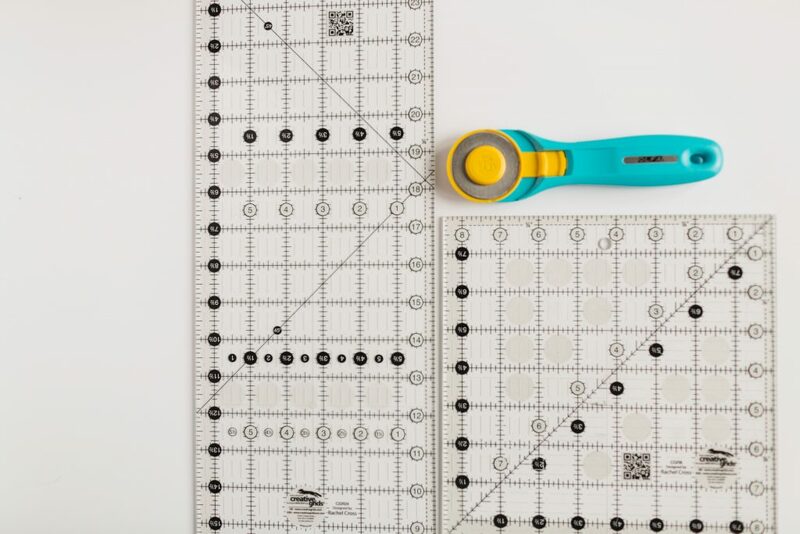 I exclusively use this when marking lines on the front of my quilt to guide me as a quilt, and it works like a dream. I highly recommend this tool! I prefer to hand stitch my binding down, so I use my thimble quite often. I also use it when I hand quilt. Thimbles are very subjective; it seems that everyone has their favorite. My recommendation is to try a few different types and see what feels best on your finger. For what it’s worth, my personal favorite is this leather thimble. 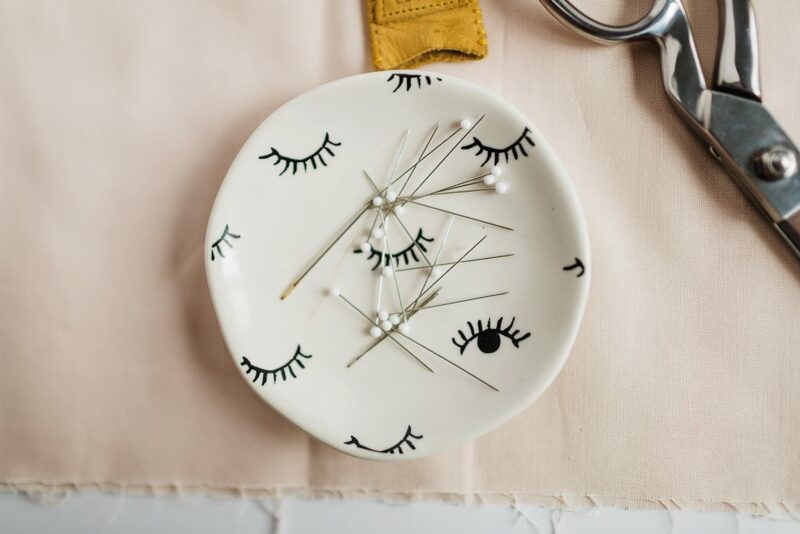 When hand sewing my binding, these needles are what I reach for most. 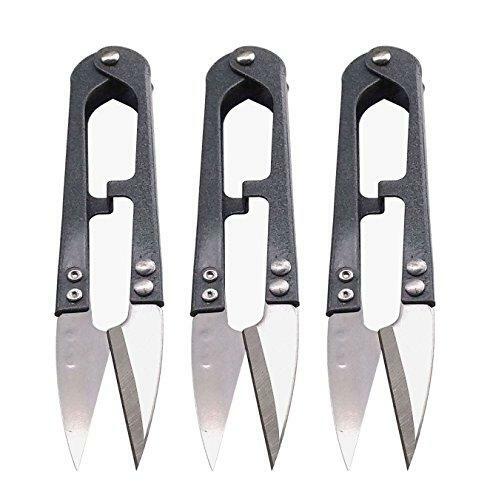 They are nice and sharp and work very well for hand work. The last thing I’ve found extremely useful is thread snips. 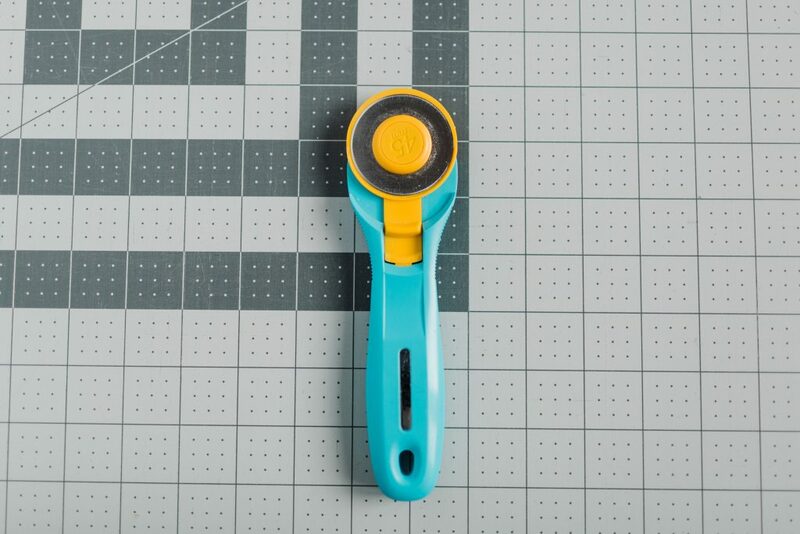 I use these to snip my threads when I’m hand binding, but I also keep these handy when I’m sewing on my machine to snip random threads here and there. These are inexpensive and very sharp. 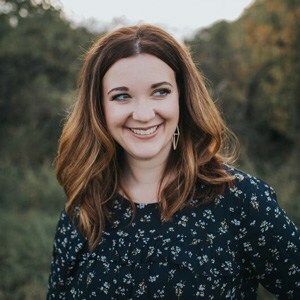 I hope you’ve found this blog post helpful! Please don’t hesitate to reach out to me with any questions! Also, if you’re feeling like diving right into a beginner-friendly quilt, I have a free baby quilt pattern available HERE.